“Well, it (Jinjer) doesn’t mean anything at all,” according to bassist Eugene Kostyuk. “It has no connection with ginger, like hair color or…. Such is the enigma of this Ukrainian band and they are an enigma in all the right ways. The current lineup – in addition to Kostyuk, is comprised of guitarist Roman Ibramkhalilov, Vladislav Ulasevish on drums, and vocalist Tatiana Shmailyuk – has developed an evolving sound based in progressive death metal, yet absorbing broad influences ranging from jazz to Nu metal. Jinjer has been making waves around the world due to their unique mixture of these sounds. “Each of us has absolutely, well not quite absolutely, but quite different musical tastes,” Kostyuk explains. “Me personally, I’ve always, well for a really long time, been into progressive metal. Death metal, such as bands like Daath, and the European progressive scene, like Opeth and Gojira. And these bands influenced me a lot along with some Nu Metal bands, especially Mudvayne who is one of my most favorite bands ever. “Roman, his musical roots come from thrash metal bands like Metallica and Slayer. And later he got into Nu Metal bands like Slipknot. And Vlad, he is a big fan of the death core scene. In this way, the musicians in Jinjer share a commonality of interests yet celebrate their differences, deftly illustrated in their music and live shows. But what does this sound like exactly? Every band will tell you that different songs sound better live, while others suit the studio environment better. “I can’t pick any I prefer but there are a couple that I think sound better live than on the record, ‘I Speak Astronomy’ and ‘Pisces’,” Kostyuk conveys. 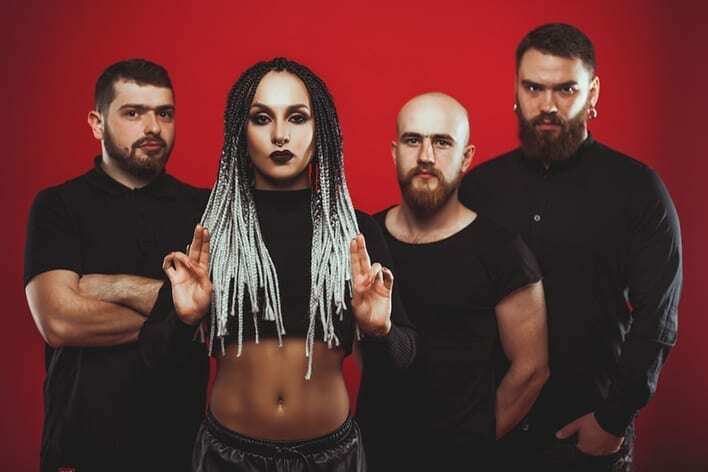 Now on their second tour in America with Devildriver and Raven Black, Jinjer is excited to be on tour, as well as having an opportunity to test out the forthcoming songs on their soon to be released EP. “We just released the first single, it’s called ‘Ape’,” Kostyuk revealed. “It’s been out online for one week. The EP, if I’m not mistaken, will be out in November. It’s gonna be five tracks of new songs. Catch Jinjer in all their mysterious glory, and get some brand-new aural treats, when they play the Whisky in Los Angeles on Nov. 16 and Brick By Brick in San Diego Nov. 18.